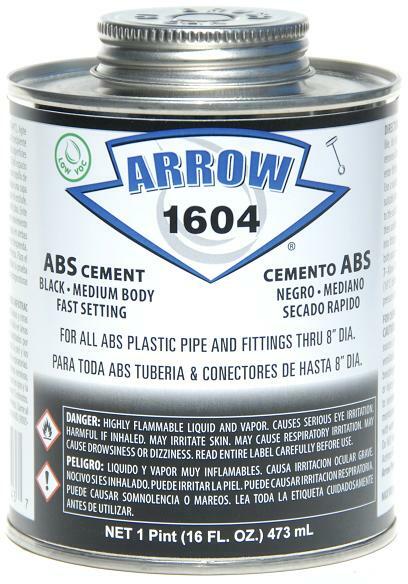 1604 is a medium bodied, fast setting ABS cement for use on all schedules and classes of ABS pipe and fittings up to 8” diameter with interference fit. Listed by NSF International for compliance with ASTM D 2235, the Uniform Plumbing Code, NSF/ANSI Standard 14 for use on drain, waste, vent and sewer applications (G-dwv-sw) and NSF/ANSI Standard 372 ‘lead free’. 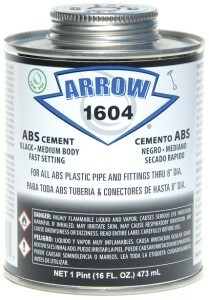 High-strength formulation for all ABS piping systems including drain, waste, vent, sewer, conduit and all non-pressure applications.